Watching the world change is exciting. And with employee engagement becoming a CEO-level issue, the world of work is already shifting. One of the coolest changes is getting these HR, recruitment and people-conversations happening in the highest levels of the business. And that’s largely down to the recognition of this fact: Employee-centric organisations aren’t just about making people happier and more fulfilled (although arguably, that would be enough motivation). Prioritising employee engagement is better for business. There’s the major retailer who can forecast sales results based on the previous week’s employee pulse survey results. Or the electric company who, after investigating a major outage discovered the issue could have been predicted (and prevented) by looking at employee feedback data. Money talks and the C-suite recognise the value of engaged employees. Deloitte’s latest HR Trend Report showed 9 out of 10 executives – that’s 85% – in this year’s survey ranked engagement as one of the top priorities for their business. And these leaders are prepared to make dramatic changes to business structures to improve that employee engagement. Employee-centricity (try saying that four times fast) is about creating engaging workplaces where your people feel fulfilled, valued and are given the opportunity to perform at their highest potential. The Deloitte study calls these “Simply Irresistible Organisations”. People (your people) are placing a higher premium on flexibility, creativity, and purpose at work. That makes them notoriously tricky to hold on to. They’re choosing you now, but they can just as easily un-choose you later. One approach some companies are taking is to start considering employees less like employees, and more like volunteers. This means constantly exploring how we can make work more meaningful and rewarding for our people. It’s a shift that requires us to collect feedback on employee engagement far more regularly than in the old trusty annual survey approach. So how exactly does an employee-centric organisation measure employee engagement? Here’s a scary stat: 1 in 5 executives surveyed in Deloitte’s Trend Report admitted their companies do not measure engagement at all. For many more of us (64% to be exact), measurement is limited to that once-a-year survey. Hugely comprehensive, expensive and time-consuming for just about everyone involved, these are great for telling you what happened in the past. But if you’re interested in how your teams are doing today, or if you want to predict engagement tomorrow? Let’s just say they won’t be earning the <Bomb>-diggity emoji anytime soon. 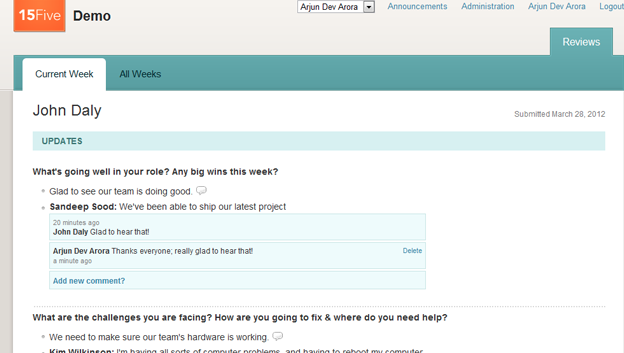 15Five automates weekly check-in between managers and teams. Light and beautiful to use, it give managers a steer on how each person is tracking against goals, how they’re feeling, where they’re struggling and more. Questions are simple and there aren’t an endless stream of them – it’s usually limited to the same 3 or 4 question each week. The idea is it takes just 15mins for the employee to complete the short, simple report each week, and 5 mins for the manager to read, analyse and respond. Reports can be shared with the whole team or limited to just the manager and, best of all, the employee has control over that visibility so they can feel safe speaking freely. 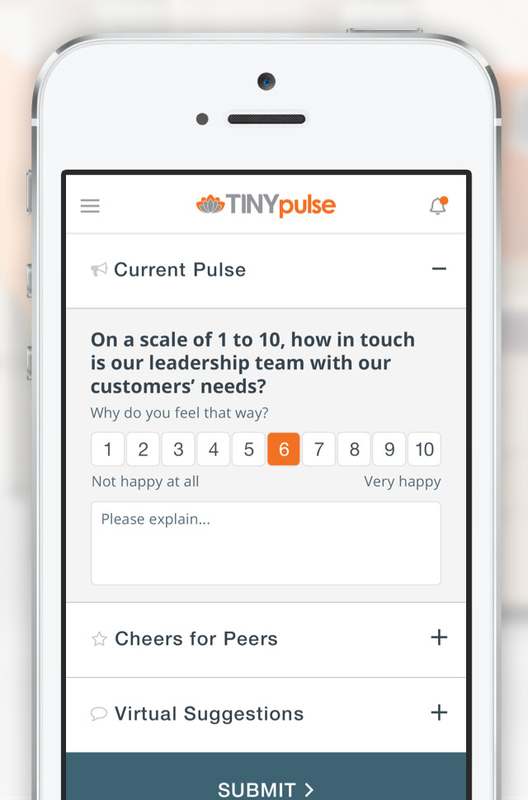 More of a true survey tool, TinyPulse’s big appeal is that responses are 100% anonymous. Managers can then engage further with a respondent if they want to dig deeper into one of their answers, but anonymity is still protected. In some situations, this can allow for more honest feedback – particularly great if you’re trying to get a real understanding of your front line culture. These guys are the full-noise engagement tracking solution. They can do a whole range of different surveys – from larger, more comprehensive ones that are great for establishing benchmarks, through to tiny “one question per day” pulse checks sent out for employees to answer on their mobiles. 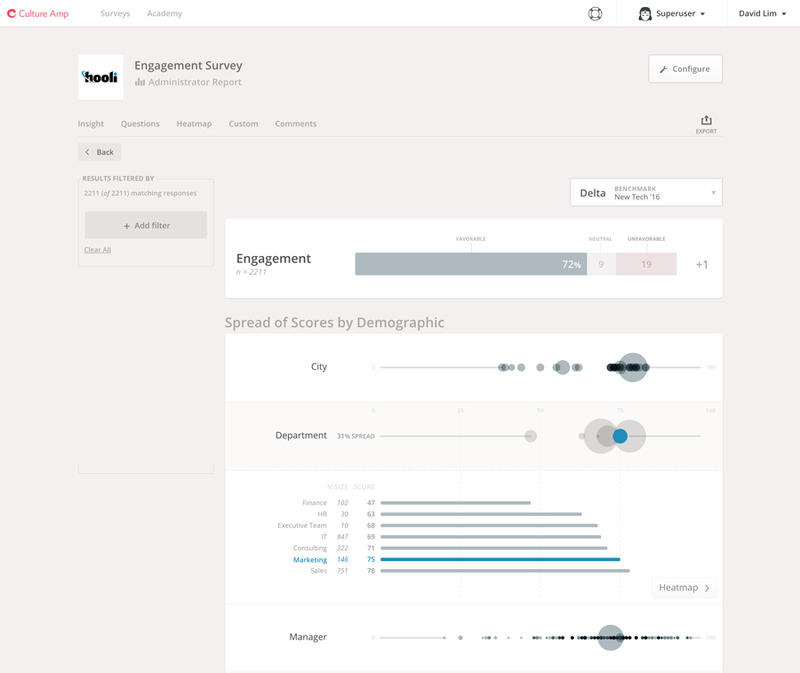 Surveys can be sent out to segmented audiences within your organisation and data is collected and displayed on a super-friendly dashboard. It’s an awesome solution if you’re getting serious about engagement. Oh, and it’s pretty lovely to use too (for employees AND managers). Creating a culture and workplace environment that’s dedicated to employee engagement isn’t a luxury for the handful of hipster Silicon Valley startups anymore. The changing world of work demands we create employee-centric organisations and frankly, when a movement like this has a theme song like Simply Irresistible, you can’t ignore the call. Weirdly video integration: It's heeeere!